A Tribe Called Red Replace DJ Shub? Self-described "pow wow-step" outfit A Tribe Called Red have quickly become one of the most beloved electronic groups in Canada, with Polaris nominations, a Juno Award win and several Aboriginal Peoples Choice Music Awards to their name. Some changes might be afoot, however, as the group are rumoured to be replacing their DJ. The Ottawa Citizen points to a news post from the Aboriginal Peoples Television Network. The story states that DJ Shub (a.k.a. Dan General) may have been replaced. "We are waiting to hear from lawyers right now and an official statement will be released then if that's what's going on," DJ Shub told the publication. The news was echoed by West Coast First Nations hip-hop pioneer Manik 1derful (a.k.a. Derek Edenshaw), who posted a all-caps status update on Facebook. 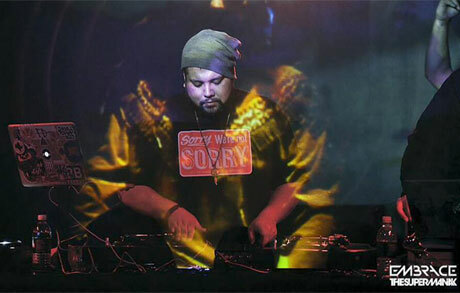 Manik, who referred to Shub as "the best native DJ alive," suggested that Shub has been replaced by new Tribe DJ 2oolman. The band's Facebook page has been updated to corroborate this information, saying that the group are "currently made up [sic] DJ NDN, Bear Witness and 2oolman." It's unclear if the switch-up was amicable or not. So far A Tribe Called Red have not issued a formal statement of the matter. Stay tuned for more information as it becomes available.